It's rather interesting, we here in the Air101 tend to agree, Jason never eats breakfast - unless you include that dark brown sludge he calls coffee in an ancient Denby mug breakfast. Yet, away from home or office, he does like to indulge in scrambled egg. Josh has one of those cereal type bars for breakfast every day, unless he's swanning it up in a hotel then it is the full works. Adam, however, is the creature of habit, he always has a bowl of rice crispies (or the nearest equivalent) home or away or at aunty Jean's. Oh, an none of the team are American despite Jason living there for a while and Josh seeming to be going to Boston every other weekend! The Hyatt Place survey of 1,507 respondents, which was conducted by Toluna on behalf of the Hyatt Place brand, looked at a range of breakfast habits among those who travel at least six times or more per year (frequent travelers) versus those who travel five times per year or less (infrequent travelers). Recently, the Hyatt Place brand unveiled a new elevated regional breakfast experience at Hyatt Place hotels across the U.S. Guests have the option to choose from a variety of high-quality breakfast offerings that draw from food culture from five regions across the country, including the Atlantic, South, Heartland, Southwest, and West Coast. In addition to the regional breakfast rotations, Hyatt Place hotels in the U.S. will offer cage-free scrambled eggs, cage-free hard-boiled eggs, all-natural bacon and sausage, Oikos® Greek yoghurt, fresh-cut fruit, steel cut oatmeal, rosemary-garlic potato medley, and artisanal bread, including banana yoghurt bread and zucchini spice bread. 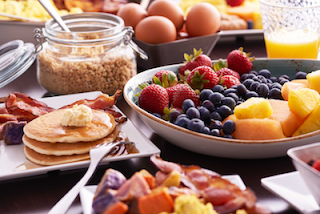 According to the study, respondents from the Northeast chose the “Atlantic” breakfast menu as their favourite, while respondents from the Midwest chose the “Heartland” menu and respondents living on Western half of the U.S. preferred the “West Coast” menu. Southerners were found more likely to try the different regional menus offered at Hyatt Place hotels. World of Hyatt members who book an Eligible Rate or a Points + Cash Rate or are on an award stay will enjoy this breakfast complimentary with their Hyatt Place stay. For all other guests, the breakfast will be available for purchase1. 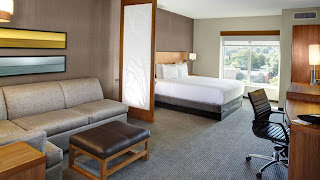 Guests can sign up for World of Hyatt at worldofhyatt.com.